08:00 - 09:10 - Still in bed. Messing around on my phone. 9:00 - 10:00 - Mif stares at me til i give her some breakfast. Then stares at me until I stroke her. New episode of Night Vale! 10:00 - 11:00 - Get ready & head out to work. 11:00 - 12:00 - Reading The Amazing Maurice and his Educated Rodents on the bus into work. (I'm out of practice drawing rats). Darren thinks the office should be more like Green Wing. 12:00 - 1:00 - An hour of website statistics and disappointing pork pies. 1:00 - 2:00 - Tweak the Express FM logo slightly, update the branding guidelines & send them to David for approval/distribution. 2:00 - 3:00 - Someone leaves one of the windows open and the wind breaks the blind. I have to wrestle it back into its runner. 3:00 - 4:00 - More Amazing Maurice on the bus home. Arrive home to find mum & Elizabeth in a blanket fort behind the sofa. 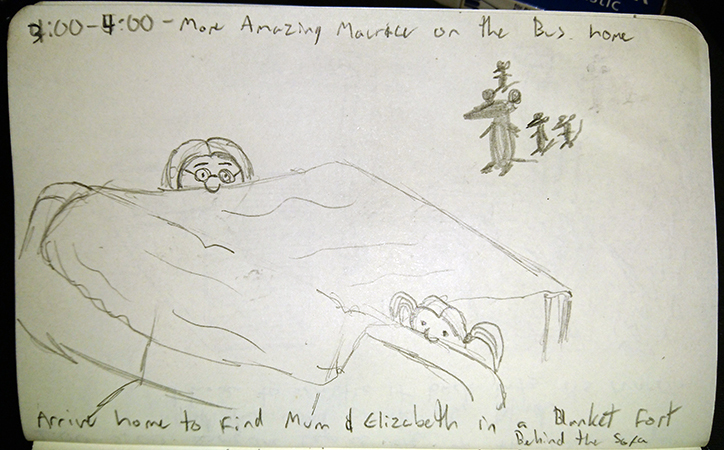 4:00 - 5:00 - Entertaining Elizabeth. Stroking Mif. Playing with Moomin figures. Eating imaginary pancakes in the blanket fort. 5:00 - 6:00 - Attempt to do the crossword while Elizabeth has her tea. Ash comes to collect her. 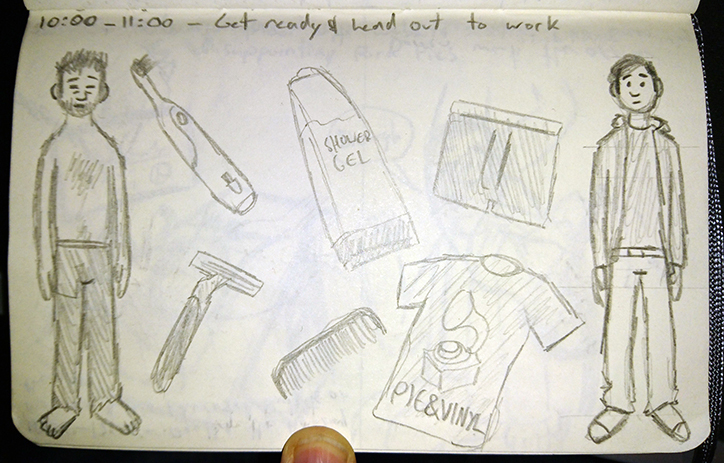 6:00 - 7:00 - Watch the Mythbusters pick up a car with a vacuum cleaner while I make a start drawing my hourlies. 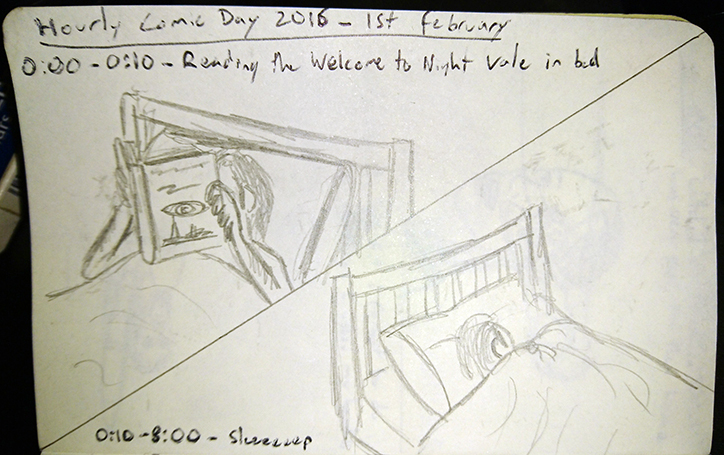 7:00 - 8:00 - Still drawing, then watch new Agent Carter over dinner. 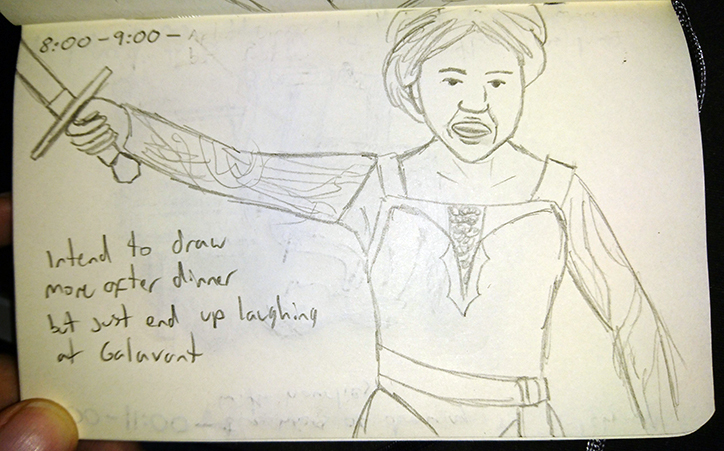 8:00 - 9:00 - I intend to draw more after dinner, but just end up laughing at Galavant. 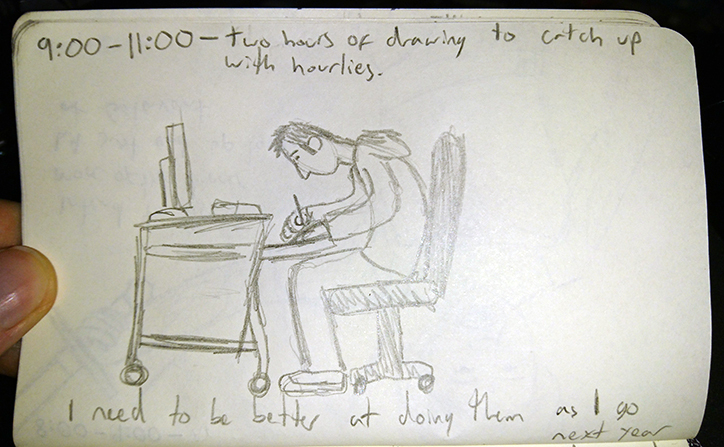 9:00 - 11:00 - Two hours of drawing to catch up with hourlies. I need to be better at drawing them as I go next year. 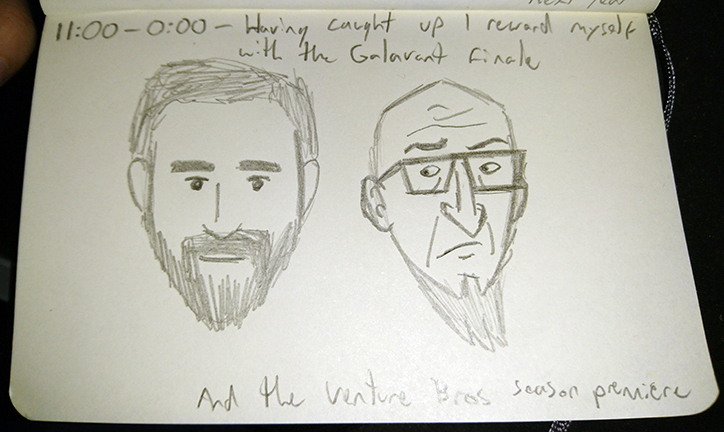 11:00 - 0:00 - Having caught up I reward myself with the Galavant season finale and the Venture Bros season premiere.